Overall IAAF World Ranked number one Yelena Isinbayeva of Russia, the Olympic champion improved her World record for the women’s Pole Vault tonight at the 30th edition of Athletissima, IAAF Super Grand Prix meeting. "It's fantastic for me, I'm so happy," Isinbayeva told Reuters. "It's not easy, even if it looks easy." Isinbayeva, 23, who broke the World Indoor record four times last winter, was opening her outdoor season tonight, and in the process she raised by one centimetre her own World mark (4.92m) which she had set on 3 September last year at the Van Damme TDK Golden League meeting in Brussels. The World record now stands at 4.93m*. The former gymnast from Volgograd needed just two earlier jumps - 4.60 and 4.70 - both of which she took on her first attempt before a perfect World record at 4.93 with a big margin between her and the bar. These three were her ‘only’ performances this evening, and only one jump at 4.60 was enough for the Russian to secure the win, as 2000 Olympic champion Stacy Dragila finished second with 4.60m a height which she had taken on her second attempt. “I used old poles because the wind was strong. I decided to stop after 4.93 because I wanted to take a rest before my next competition in Rethymno on 10 July. There I will try again. The support from the crowd was crazy. I believe that 5 metres is like 6 metres in men’s Pole Vault. The first woman to break the 5 metres barrier will be a legend”, said a characteristically outgoing Isinbayeva during the post meet press conference. 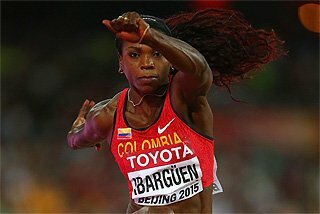 Apart from Isinbayeva’ s World record the Lausanne meeting also produced three World seasonal bests - Virgilius Alekna in the men’s Discus Throw (70.53); Marian Oprea in the men’s Triple Jump (17.81); Chandra Sturrup in the women’s 100 metres (10.84) a sprint which featured two more women under 11 seconds. Momchil Karailiev from Bulgaria leapt to 17.36, two centimetres better than the previous world seasonal leader (17.73) Jadel Gregorio who jumped 17.34 for third. The Brazilian was defeated for the first time this season in what was his European debut in 2005. Three other men jumped over the 17 metres barrier: Nathan Douglas from Great Britain (17.27), Vyktor Yastrebov from the Ukraine (17.15) and Dmitriy Valyukevich (17.04). Double Olympic champion Alekna improved the previous world leading mark of Gerd Kanter from 70.10 to 70.53. 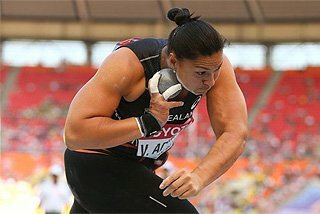 The star from Lithuania backed up this impressive result with three more throws over 67 metres (67.92 – 67.79 -68.69). Estonian Kanter took second spot with 68.32, ahead of Olympic silver medallist Zoltan Kovago from Hungary (65.61). Bahamas’ Chandra Sturrup set the fastest time in the world this year with an impressive 10.84 in cool weather conditions. 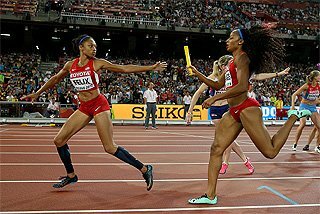 Olympic silver medallist Lawryn Williams from the US set her seasonal best and the second fastest time in 2005 with 10.91 for second, edging out French star Christine Arron who also ran under 11 seconds with 10.94. USA Championships winner Melissa Barber, who trains with Chandra Sturrup, was fourth in 11.12. “When I saw the scoreboard I was excited,” confirmed Sturrup. “I never take into consideration cool weather conditions. I had a very good start but my race was not perfect. 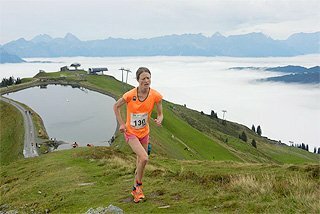 It was my seventh race of the season after taking one year off due a tibia injury. I will return to my country to run the CAC Champs. 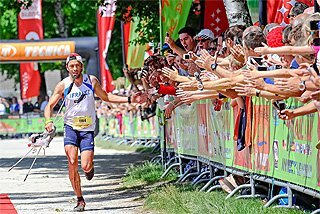 Then I will return to Europe for Madrid and Stockolm before the World Championships. I want to run 10.7 in Helsinki and win the World title. 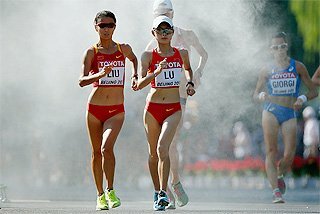 I think that 10.8 could be enough to win in Finland,” said Sturrup. The 100 metres women B race went to Italy’s Manuela Levorato who improved her seasonal best to 11.40 running with the greatest ease. European Indoor record holder Ronald Pognon ran under 10 seconds for the first time in his career breaking the 100 metres French record which had been held by Daniel Sangouma (10.02). His time was 9.99 and it edged out Paris TDK Golden League winner Aziz Zakari from Ghana by three hundredths of a second. Olympic champion Justin Gatlin finished third in 10.03. 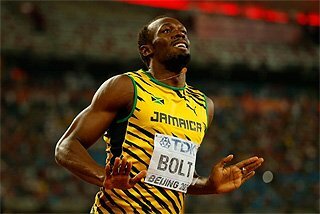 Gatlin’s training partner Shawn Crawford, Olympic 200m champion, pulled out on the eve of the meeting due to a foot injury. Patrick Jarrett from Jamaica ran 10.33 beating the US Coby Miller (10.42) in the 100 metres B sprint. “The track was very fast. Spectators were fantastic. I knew I had the potential to run under 10 seconds today”, said Pognon. Tatyana Lebedeva collected her second seasonal win after her 15.11m in Paris with another Triple Jump over 15 metres. She leapt to 15.05 in her first attempt which secured the win. Her compatriot Ana Pyathik improved her seasonal best to 14.88, taking second place over Jamaica’s Trecia Smith, third with 14.81. 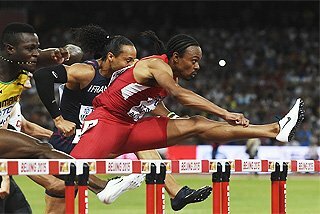 Olympic champion Liu Xiang and silver medallist Terrence Trammell ran the same time with 13.05 in the men’s 110m Hurdles but the photo-finish awarded the win to the Chinese who set his seasonal best. Dominique Arnold was third in 13.25. Allen Johnson suffered a slight injury and pulled out of the meeting to avoid any risk. Sweden’s Robert Kronberg took first place in the 110 hurdles B race in 13.45. US champion Sanya Richards produced the upset of the evening beating Olympic champion Tonique Williams Darling in the 400m, breaking the 50 seconds barrier for the third time this season with 49.95. Williams Darling finished runner-up in 50.14. “It wasn’t a bad race. Of course I am never happy with second place. The race was very tight in the end. I should have given more energy than what I actually gave”, said Wiliams Darling. On the men side, Olympic 400m champion Jeremy Wariner ran 44.96 to take his second European win this summer, defeating Bahamas Chris Brown (45.02) and 2003 World indoor champion Tyree Washington (45.37). Brandon Simpson from Jamaica took the 400 metres B race in 45.26 beating 2003 World bronze medallist Marc Raquil from France ((46.06). “It was not a bad race although the time could have been better”, said Wariner. 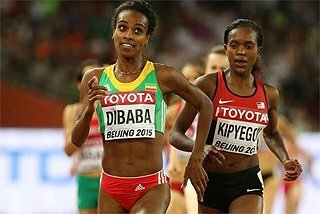 Kenenisa Bekele ran to an easy 3000 metres win in 7:34.57 after taking the lead at 1400 metres. 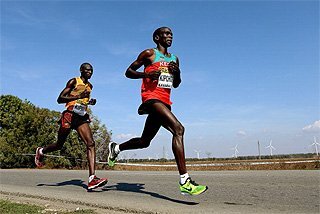 The pacemakers ran the 1km in 2:29.69 and ended their task after 1400 metres, and so Bekele was left alone running against the clock. It was a good day for his younger brother Tariku who confirmed his 12:59 PB in Paris with an excellent second place in 7:38.18 kicking away from his compatriot Markos Geneti, third with 7:38.42. Local favourite Maryam Yusuf Jamal from Bahrain, who lives and trains in Lausanne, took her second Super Grand Prix 1500m win of the season in 4:01.75 which confirms the form of her fantastic world seasonal best (3:59.13) set in Athens in mid-June. Olympic finalist Natalya Yevdokimova who remained in contention for the win in the last lap, was second in 4:02.75. In the men’s High Jump, Russia’s Vyacheslav Voronin defeated Olympic champion Stefan Holm from Sweden on countback with both clearing 2.31m. 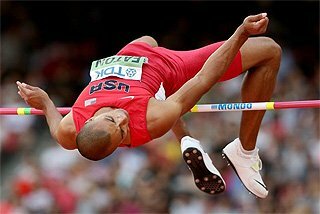 The former World champion from Russia jumped 2.31 on his second attempt, while the Swedish star needed three attempts at this height. Rachid Ramzi from Bahrain showed a good return to form winning the men’s 800 metres in 1:44.75. Paris Golden League winner William Yampoyi was runner-up in 1:45.75. 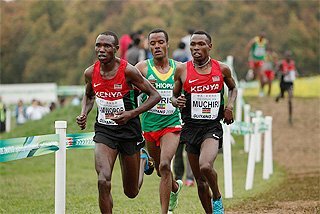 Kenyan Suleiman Simotwo produced a major upset in the men's 1500 metres beating favourite Rui Silva from Portugal (Olympic bronze medallist in Athens) and US middle distance hope Allan Webb in 3:34.12. Portugal’s Francis Obikwelu, Olympic silver medallist in the 100 metres, clinched a narrow win over Zimbabwe’s Brian Dzingai in the 200 metres in 20.58. Zulya Calatayud from Cuba showed that she may be a factor in the fight for World medals after a tactical women's 800 metres won in 1:59.35 over 2005 Paris TDK Golden League winner Svetlana Cherkasova from Russia, who finished runner-up in 1:59.99. Morocco’s Ait Hammou took the B race in 2:01.52. Bayano Kamani from Panama, Olympic finalist in Athens and winner of two TDK Golden League meetings in Brussels and Berlin last summer, finished first in the B 400 metres Hurdles race in 48.36 over South Africa’s Pieter De Villiers, runner-up in 48.46. Both Kamani and De Villiers ran faster than the US Olympic fourth placer James Carter who took the honours in the A race in 48.48. A dramatic women’s 100 metres Hurdles confirmed the good form of reigning US champion Michelle Perry who ran 12.61 beating 2001 World outdoor and indoor champion Anjenette Kirkland by four hundredths of a second. European Indoor champion Susanna Kallur from Sweden ran 12.70 to take third place ahead of Jamaica’s Brigitte Foster (12.71). Disaster struck again for World champion Perdita Felicien who heavily hit the last hurdle and fell to the track. Good times were run also in the second and third series of the women’s 100 metres Hurdles. The C race featured the win of Russia’s Irina Schevchenko in 12.78 over Jenny Kallur (12.99). Four women dipped under 12.70 in the B race: Spain’s Glory Alozie came in first in 12.62 taking first spot ahead of Germany’s Kirsten Bolm (12.66) and the Jamaicans Laceena Golding Clarke and Vonette Dixon, who shared the same time of 12.67.